We've heard that the iPad 5 was going on a diet ever since the iPad mini showed up last year, and now we have reason to believe it really is trying to wear the 7.9-inch tablet's skinny jeans. The iPad 5 screen is said to use the same film-based touch panel that makes the iPad mini thin and light, replacing the weighty-glass based material currently used, according to unnamed sources who spoke to The Wall Street Journal. The iPad 5 is expected to be announced in October, as Apple unveiled the iPad 4 and iPad mini near the end of that month last year. With two months to go before history is likely to repeat itself, we're hearing plenty of rumors about the company's next full-sized tablet. 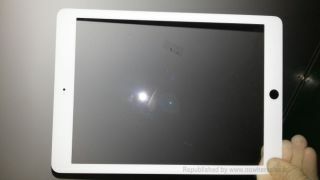 It seems the protective glass used in the new iPad will mimic the iPad mini's thinner bezel, while factory photos of its purported casing demonstrate a slimmer body. All of this plays into rumors that the tablet's iPad mini-like scale makes it 33 percent lighter than the iPad 4. Read about the possible iPhone 5S launch event on Sept. 10.